New Zealand. My dream destination for a very very long time. Last year during my birthday (which was actually before the year ends), I thought about the things I wanted to do the most that I haven't done yet. This came to my mind first. It was then that I decided that I'm going to this stunning country this year, no matter what. An expensive country to visit like NZ definitely requires a visa from Filipinos. The good thing is that, the visa fee is waived for us Pinoys if we are just visiting up to 59 days. You just have to pay for the processing fee. Sounds good to me! 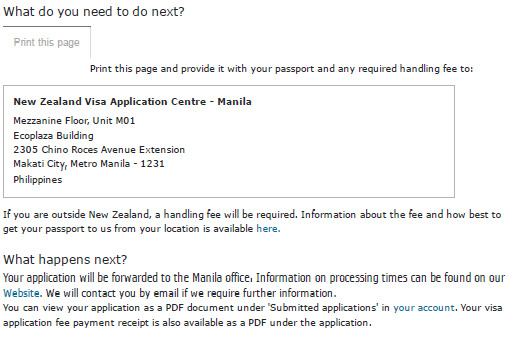 Just like Oz, I found out that we can apply online for the NZ visa. I actually prefer this method over paper application. No printing and photo copying, more eco-friendly and it is faster and easier to do so. Again, a scanner is a must for online visa applications. Otherwise, you are required to submit a paper application through VFS. Scan your passport photo page. Your scanned photo should be passport-sized, neutral face and in light background. Bank Statement - for the last 6 months. If you have an online banking account, you can save or print as pdf from there. For passbook accounts, scan it. Bank Certificate - I requested my bank to reflect my account opening date and ADB. Not really required but I think this will give an edge to my application too. Credit Card Statement - for the the last 6 months. Get it from your online account or scan your paper statements. Those marked with asterisk (*) are optional requirements that I submitted which I believed could positively affect my visa application. There is no need to notarize any of the documents. I just scanned all of my docs. Only translated documents requires notarization. NZ Immigration website has a file size limit. The size of each document must not exceed 10MB. Each document type should be uploaded as a single file. For example: 6 months credit card statements, flight bookings, passport pages with visas and stamps. Instead of uploading it one by one, you should merge them into one pdf file per category. Make sure to register your most frequently used email address because this is where you will receive updates regarding your application. Fill out all applicable fields and answer all questions honestly. Make sure to proof read before submitting to avoid delays in application process or incorrect information on your visa. when you reach this part, you're almost done! You must print it because you will need to bring that along with your passport to VFS. But don't go right away to VFS. 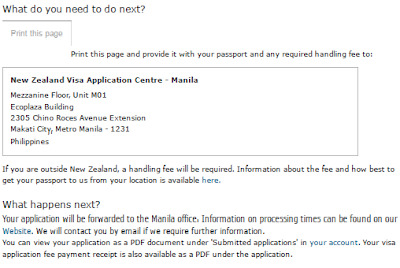 Wait for an email from NZ Immigration acknowledging the receipt of your application on their end. That's the time that you can go and drop your passport. Step 4: Submit your passport to VFS. VFS is the third party agency that processes paper visa applications and accepts the online applicants passport submission for NZ. Their address is on the photo above or you can just click the link to check their office hours and phone number. Courier is optional but it'll work well if you live far from VFS or like in my case, I find it burdensome to go back and forth to VFS. Anyway, I spend almost the same amount of money for Grab/Uber going to their (not so accessible) location so might as well just have it couriered. It's actually quite steep for a one-way courier but whatever. SMS fee is also optional but I also found it very helpful and it'll lessen your worries about the status of your application. As in they will give you updates from the time it has been forwarded to the Embassy until the time it was dispatched to the courier. My visa processing took 3 business days. This is from the time I submitted my passport to VFS until the day I received my passport back at home. Pretty fast! If I'll include the time I submitted online plus the day I waited for the acknowledgement email, that's only 2 business days additional. Note: I deleted crucial information from the photo because this visa is valid until next year. It looks longer than what I've stated above because there are 2 weekends in between and I didn't bring my passport to VFS right away. But all in all, it only took 5 business days. If NZ is also your dream destination, I hope this post helps you with your trip planning. A year ago, I did not push through with my plans thinking that getting this visa is taxing or much more complicated than getting a Schengen. It was easier than I imagined! Hi miss lizzie, quick question. What happened to your passport? You said you got the e visa, so they sent back your passport wothout the sticker? Did they include anything with the passport like a letter saying your visa was appproved? I just received my e visa today with 2 yrs multiple entry. But my passport is with the embassy because i sent them my passport. It would have been nice if i had the stickers too. Lol. Thanks! Sorry, was too busy during the Holiday Season! Yep, there was no visa sticker. Just a slip stating that my visa was approved and it's restrictions. I think you know by now because I replied too late haha! Enjoy NZ!!! Hi. I just got an email from VFS earlier that my application has already been processed and my passport has already been dispatched. 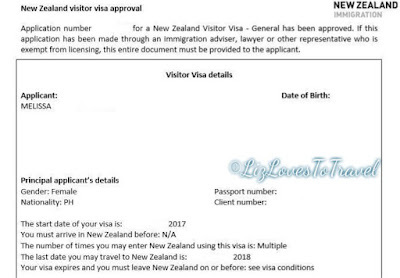 However, I haven’t received any email yet from Immigration New Zealand whether I was granted a visa or not. Have you received your visa via email or was it printed in actual paper together with your passport? Hello! In my case I received emails from both online services and the immi online around 10AM before I received an SMS update from VFS that my passport is ready for collection. Then around 6PM the same day, I received another SMS saying that my passport is already dispatched to the courier for delivery. To answer your question, I received my visa via email but at the same time it is printable from the immi account. It wasn't printed together with the passport. There is just a small slip of paper inserted confirming that there is no visa sticker and stating the e-visa rules and restrictions. me, i also received my passport earlier, however no eVisa had inserted to the passport, instead, only a piece of yellow paper with the same notifications of you miss lizzie...now still waiting, if the visa is approved or not. Hello Jhunach! Did you also apply online? If yes, no visa sticker will be given with the passport. Please check your email and RealMe account. 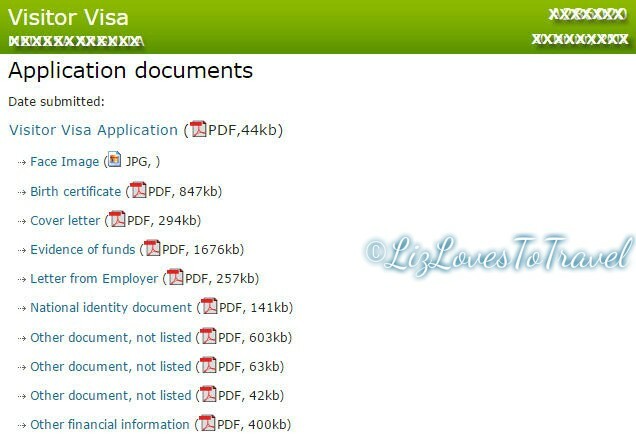 You can download and print your EVisa from there. I don't think they will request for your passport if you are denied. Hope this helps! Hi Miss Lizzie.. Just wanted to ask. I have a 9 months visitor visa and multiple entries right now for NZ. I am confused, based on my visa condition its stated "Return/Onward ticket is not required". As Im going to buy a one way ticket, the ticketing agency told me that I have to buy a roundtrip or else I may be held at the Immigration in the airport. I was sponsored by my fiancé there in NZ she have a work visa. I am a fiipino. Hello. I'm not sure what kind of visa you got but for my visitor visa, it WAS NOT stated anywhere that a "return/onward ticket is not required". Though it may not be required, please keep in mind that the Immigration Officers have every right to deny your entry the moment they find you suspicious on your intent. When I touched down in Queenstown Airport, I was interviewed twice. They are really making sure you don't have plans of staying illegally. You may risk it if you want, but personally I won't advise going there without a ticket going out of NZ to avoid any problems. That's just my 2 cents. It's still up to you. Hi Do you know which section should I upload the Letter Of Invitation if I have one? Hello there. It would be more appropriate under the "Other document" category. Goodluck! Just wanna ask, what if I don't have any bank certificate and bank statement? My friend in New Zealand is the one who will spend for my visit there? And I don't have also a employment cert.? is it possible I won't be approved in that case?